A trial member recently asked the Team for their input about the value of Endurance Nation vs hiring a local triathlon coach to prepare for their next Ironman. Before We Start: Don’t confuse proximity with proficiency. So the guy/gal lives in your town, you can ride/run/swim with them now and then, meet for coffee, etc. That’s great. But this is a brave new world of video calls via Skype, the HD Flipcam + Youtube, and podcasting from your iPhone. We believe that the nearly everyday technology of the modern world has significantly reduced the advantage of proximity. #1. Is triathlon coaching your full-time gig? If you’re reading this post, it’s likely that you have/have had a real job. It’s also likely that there are part-timers in your field. In your experience, what are the knowledge and proficiency differences between full-timers and part-timers in your field? Triathlon coaching is no different. Triathlon has grown by leaps and bounds over the last ten years, creating opportunities for many folks to hang a shingle and call themselves a coach. The price point of 1:1 triathlon coaching ($150-400+/month per athlete) can enable a new local coach to assemble a squad of 10-15 athletes at the default rate of ~$200/mo relatively quickly, providing a decent living when combined with the income of a real job. The net is that 90% of the coaches out there are teacher, personal trainer, got-a-real-job, local-fast-guy-with-real-job/triathlon coaches. From our experience, the real job cushion usually means the coach doesn’t have to work too hard or think out of the box about how to improve their coaching skills or provide better service to their squad of athletes. Endurance Nation: Rich and Patrick have been coaching full and half Ironman® athletes, full-time, since 2001 and 2004, living in Los Angeles and Boston respectively with no safety net. This full-time focus has demanded that they think significantly outside of the box for how to best coach and service their athletes, leading to our suite of online resources, lower prices, race site support and free training camps. Every year brings a new suite of innovations to our plans and community. 2. How many Ironmans have YOU raced? We aren’t saying that you need to be fast Ironman® athlete to coach people to an Ironman. While there are many high-dollar coaches without an Ironman® finish to their name, we all know there are things you learn by doing that you can never pick up in a book or the latest article on triathlon training. Through their training and racing a combined 25+ Ironmans, including 5x Kona, Rich and Patrick like to say that they have made every conceivable mistake you can make…so you don’t have to! So when Rich and Patrick send you out on a Saturday to ride 4hrs of intervals, not 6hrs of Z1-2 riding, it’s because they themselves have tried every possible permutation of Ironman® training ride and have learned, through their own experience, which is best. Their experience saves you years and years of learning the hard way. 3. How many Ironman® finishers have you coached? Show me their results and testimonials. A significant weakness of the 1:1, small squad, part-time Ironman® triathlon coach is simple experience and small sample size. How much can you learn if you’ve only raced a couple Ironmans yourself and have coached maybe a couple dozen local athletes to Ironman® races? 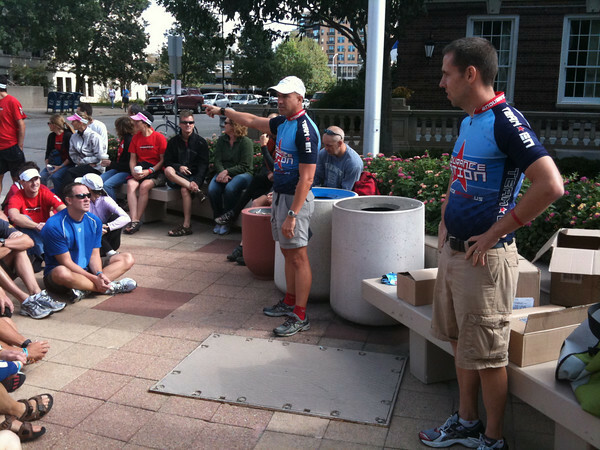 Before they founded EN in 2007, Rich and Patrick had coached well over 400 individual Ironman® athletes between them. And in the four years since it’s founding, EN has grown from a squad of about 80 athletes to over 500, with 20-50 athletes at every US Ironman. Now step back and think of everything that’s involved in teaching and managing a single Ironman® athlete: educating them about proper training, swim/bike/run technique, bike fit and setup, figuring out training schedules, how is that schedule different for Timmy in SoCal vs Mary in Maine, teaching them how to actually race Ironman…and much more. Now multiply that by over 2000 athletes since 2001. That’s a LOT of experience with a very, very broad range of athletes and unique situations. In short, there is no training or scheduling problem or situation that Rich and Patrick haven’t seen and had to figure out a solution for. >> Go here to review the results of our athletes and here to listen to podcasted race report interviews. 4. What is your Ironman® training philosophy? How did you develop it? Most coaches have read a book or two, few have written one. Many coaches position themselves as the loin-clothed guru, coaching out of a black box on a mountain top, only choosing to work with the Few who’ve climbed to the top of PricePoint Summit and are therefore lucky enough to work with the Guru. This is ours, the Endurance Nation Long Course Training Manual, a 130-page book we’ve written. The Manual is our application of scientific training principles to the training of real people with real lives. In short, there is what you read in a book and there’s what you learn when you apply the book stuff to the real world, and figure out your own tweaks and methods based on your own experiences and observations. See 2000+ athletes, full-time, nothing but Ironman® triathlon coaching above. We’ve also shared everything we know about training, coaching and racing here on our blog, in our podcasts, and our free seminars and ebooks openly available. We invite you to create a 5-day, free trial membership. The bottomline is want you to have every opportunity to thoroughly vet us and our coaching before you pay us a dime. We are the Anti-Guru, Anti-Black-Box coaches. 5. Do you have a strategy for racing Ironman/70.3? What is this based on? How will you teach it to me? No two coaches in the Ironman® triathlon world have managed as many rolls of the Ironman® execution dice as have Rich and Patrick. No two coaches have used this experience to create a similarly comprehensive suite of race execution products and learning tools. No two coaches manage a Team with similar numbers of Ironman® athletes, creating an ever-growing data set of what works, and doesn’t, on race day. Inside Endurance Nation, Ironman® triathlon coaching is, literally, all we do. We live it, 24/7, and have a created a training and racing system proven through the feedback and results of thousands of Ironman® finishers. Our online community has grown into a real family of amazing athletes who connect daily and meet up in-person at races and training camps across the US. But don’t take our word for it, create your own FREE five day trial to experience the energy, support and knowledge of the world’s largest online triathlon Team!